Are you confused about cartridge-free printers? Everything you ever wanted to know about EcoTank Printers…. Anything that is truly innovative is certain to provoke questions and so understandably the EcoTank with its pioneering cartridge-free design is sure to need some explanation. We’ve shared some of the most frequently asked questions to help clarify its benefits to you in terms of cost, convenience, reliability and ease. 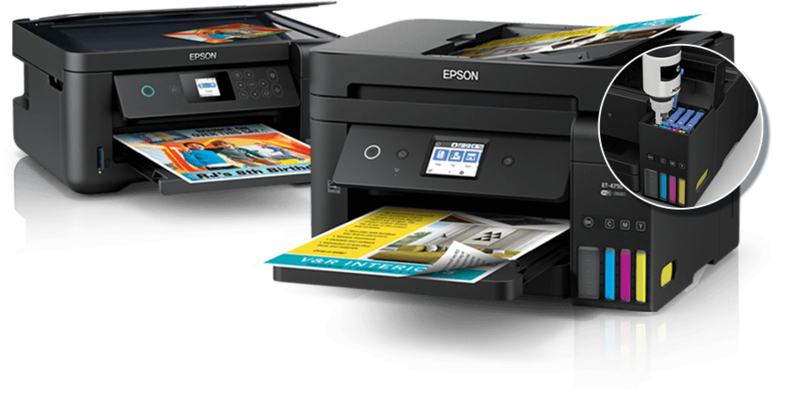 It’s a new type of printer that comes with high-capacity refillable ink tanks, instead of using ink cartridges like a typical inkjet printer. It means you can print thousands of pages without the interruption of frequent replacements. Why do EcoTanks have a higher purchase price? You get both a printer and lots of ink as a bundle with an EcoTank purchase, which means you can print thousands of pages. In fact, you get so much ink in the high-volume ink bottles that you could save 90% on ink costs on average1. The cost per page is outstandingly good as the high-volume bottles deliver from up to 7,500 pages in black and up to 7,500 in colour2. So rather than comparing the initial purchase price, you need to consider how much less the EcoTank will cost you in the long run. To make this comparison easy, Epson has a calculator where you can evaluate the top 20 best-selling printers against EcoTank to see what provides you with the best value option. How much ink comes with the printer? When we say the EcoTank comes with lots of ink, we really mean it. On average, the ink bottles that come with the EcoTank are the equivalent to 88 ink cartridges1 – just think how many thousands of pages you could print, all for the one upfront cost. And it’s a complete set of colours, so you’ll have everything you need. You might notice that the initial set of inks has a lower yield than replacement bottles. This is because when you set up the printer for the first time, some ink is used to fill the printhead nozzles. This means that the overall yield is lower from the first included set of bottles – even though they are same size as the refills. How many pages will I be able to print? The high-volume bottles deliver from up to 7,500 pages in black and up to 7,500 in colour1. The amount of pages you can print depends on which EcoTank you buy, but each one clearly states the number of pages it can produce with Epson’s genuine inks. Is it difficult to fill the ink tanks? What happens when I run out of the initial ink? It’s easy to purchase more ink at a later date in-store or online. 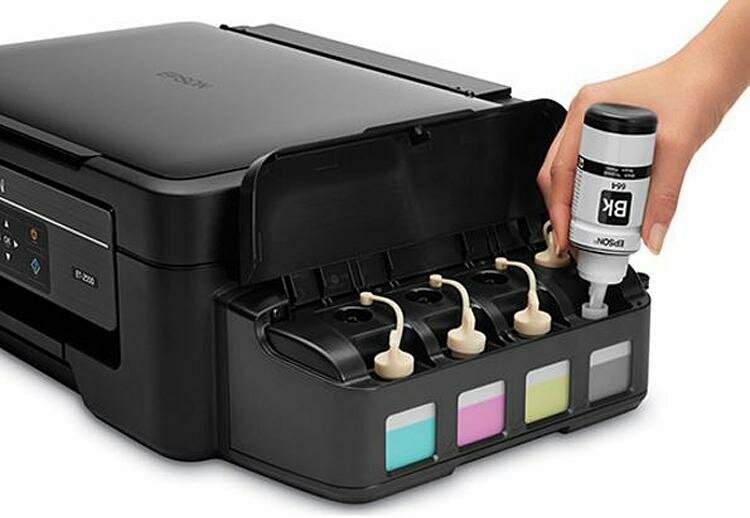 Additional genuine Epson ink can be bought at an affordable price in convenient high-volume bottles delivering from up to 7,500 pages in black and up to 7,500 in colour2. Can I buy the replacement ink colours separately? Yes, you only have to replace the colours that you need, so the colours are available individually. What will happen to the ink if left unused? The ink tank system has been designed with specific technologies to limit evaporation. Provided the inks are installed and maintained as per the instructions in the user manual, leaving long intervals between print jobs should not have a detrimental effect. Why are there different models of EcoTank? All EcoTank models feature high-capacity refillable ink tanks, but there are different models available so that you can get a printer with the features that you need. For example, you can choose between A4 and A3 printing models. While it can seem a little complicated at first, we hope to have shed some light on how the EcoTank can provide a ultra-low-cost solution for people that print often and in high quantities. We think you’ll find it easy to use with its high-capacity ink tanks that are filled with high-yield ink bottles that are included within the initial purchase. And once you’re set up and ready to go, you’ll be able to enjoy printing thousands of pages without interruption or additional ink costs. Quoted yields are extrapolated based on Epson original methodology from the print simulation of Test Patterns provided in ISO/IEC 24712 based on the replacement ink bottles. Quoted yields are NOT based on ISO/IEC 24711. Quoted yields may vary depending on the images that you are printing, the paper type that you are using, the frequency of your prints and environmental conditions such as temperature. During the initial printer setup, a certain amount of ink is used to fill the print head’s nozzles, therefore the yield of the initial bundled set can be lower.